Rain is a fact of life. If you’re carrying your lunch in one hand and work supplies in the other, then that rain is going to get on your head. That’s just what happens; pull up a hood or try to shift things around and hope you can hold everything along with your umbrella. Well, finally, someone looked at the problem of the umbrella and decided to do something about it. Enter the Nubrella, a hands-free umbrella that goes over the wearer’s head like a hood. Every summer, without fail, I was in Florida for the first 15 years of my life. This was just what my family did. Without fail, every day, it rained. The Sunshine State gets a whole lot of rain in the summer, thanks to the interaction of hot temperatures and cool ocean water. 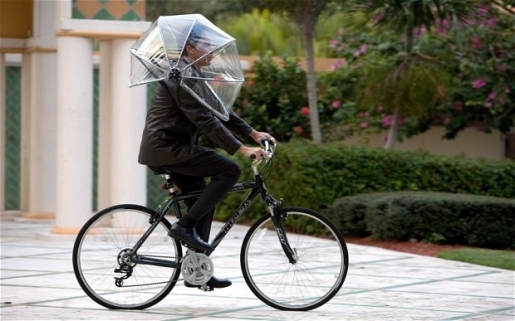 I am completely not surprised that someone from Florida invented a wearable umbrella. While it’s not cool-looking, it definitely looks effective at rain prevention and it’s pretty sturdy since it’s designed to stand up to winds up to 50 miles an hour. You can buy your own Nubrella for $49.99 at Nubrella.com.